Yesterday I posted that the new issue of the journal Icarus is now online. 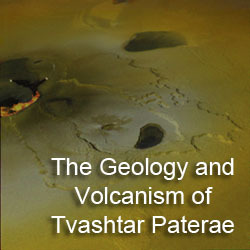 Two papers in the issue are directly related to Io. The first is titled, "Transfer of mass from Io to Europa and beyond due to cometary impacts," by José Luis Alvarellos, Kevin J. Zahnle, Anthony R. Dobrovolskis and Patrick Hamill. In this paper, the authors describe their modeling of ejecta from impacts onto the surface of Io, determining where that ejecta eventually end up in the Jovian system, and calculating how much mass is transferred from Io to the other major satellites in the system. They modeled the ejection process two different ways. First, they assumed the surface of Io is a regolith and an impact will fling pre-existing blocks or rubble out from the crater. Second, they used a model by Jay Melosh et al. (1986), where the impact ejects chunks known as spalls out from a more competent or hard rock target. Based on what is known of Io's surface, where volcanic resurfacing occurs at a faster rate than impact gardening, the authors state that the latter model is likely more applicable. The authors simulated impacts at the apex (center of the leading hemisphere), the antapex (the center of the trailing hemisphere), the sub-jovian point, the anti-jovian point, and the south pole. From the two models described above, the authors were able to calculate the velocities of particles generated by the impact as well as how much ejecta is generated by the impact of a generic 1.5 km wide Jupiter-family comet. Finally, 600 test particles with velocities fast enough to escape Io's Hill Sphere were injected into a model of the Jovian system to see where these particles would end up after an integration of 10,000 years. 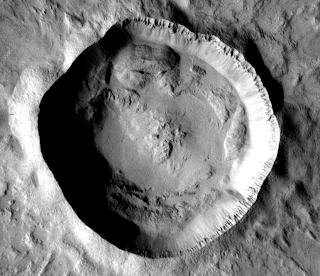 The authors determined that the vast majority of the ejecta would wind up reimpacting Io, 93% in the rubble model, 86% in the spall model. 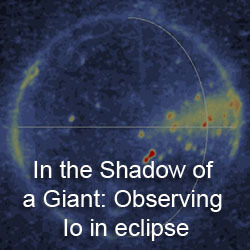 This is expected since the particles start out in Io-crossing orbits. Their simulations found that between 5% ("Rubble" model) and 9% ("Spall" model) of the test particles end up impacting Europa, typically in a few decades to a couple of centuries. In the spall model, 4.6% of the test particles impacted Ganymede and less than one percent impacted Callisto. Only a handful in that same model ended up either impact Jupiter or one of the small inner satellites, entered heliocentric space, or survived the 10,000 year simulation. Typically, more ejecta reimpacted Io in the rubble model (where initial velocities are less so they start out in less eccentric orbits) than in the spall model, where their higher initial velocities put them in orbits that crossed that of the other Galileans. 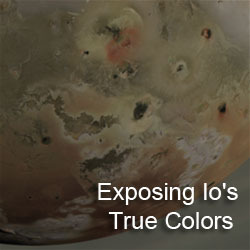 Based on the percentage of material transferred from Io to one of the other satellites, estimates of the amount of ejecta per impact (typically 3x the mass of the impactor), and the impact rate on Io, the authors estimated the amount of mass transferred from Io to one of the other Galileans per million years. They estimate that approximately 3.1×1014 g and 1.6×1014 g are transferred to Europa and Ganymede via impact ejecta every million years, making Io a significant source of minerals and nutrients to the surfaces of those moons. That's in addition to the mass transferred via sputtering.